Snap locking charm bail in sterling, measuring 10x6.0mm round in shape. Easily customize charm bracelets or necklaces by changing out charms in a snap. 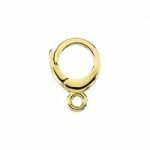 Snap locking charm bail in sterling, measuring 13x9.0mm round in shape. Easily customize charm bracelets or necklaces by changing out charms in a snap. Available in 14k yellow or white gold, measuring 8.0x5.75mm round in shape. Easily customize charm bracelets or necklaces by changing out charms in a snap. Available in 14k yellow or white gold, measuring 8.6x4.75mm elongated oval in shape. Easily customize charm bracelets or necklaces by changing out charms in a snap. Available in 14k yellow or white gold, measuring 10x5.8mm elongated oval in shape. Easily customize charm bracelets or necklaces by changing out charms in a snap. Available in 14k yellow or white gold, measuring 12.0x6.6mm elongated oval in shape. Easily customize charm bracelets or necklaces by changing out charms in a snap. Available in 14k yellow, white gold or sterling silver. Measuring 11.7x8.0mm round in shape. Easily customize charm bracelets or necklaces by changing out charms in a snap.